When we think of social networks, large communities like Facebook, Twitter and LinkedIn typically come to mind. There is, however, another type of social network that often goes overlooked: niche communities. Keeping your brand top of mind with your customer. Here are three inexpensive tools that you can use to build a niche community. 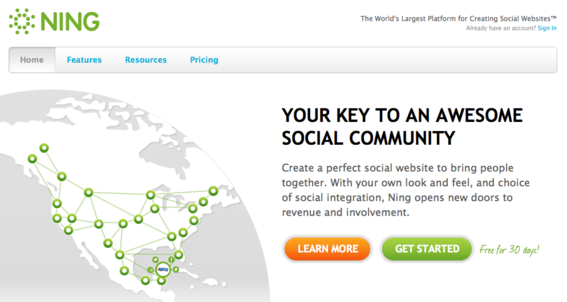 Ning is the most popular online community software. Ning is a hosted solution with a feature set that includes shared user profiles, blogs, forums, photo galleries, support for video and podcasts, a Facebook-like activity stream (newsfeed), event calendar and groups. The platform also integrates with other social networks like Facebook, Twitter and YouTube. If you’re savvy with programming, you can use Ning’s APIs to link to your own applications. Ning also offers several revenue-generating opportunities, which might interest ecommerce merchants. For example, you can charge members for access to specific content or groups. Merchants can also run ads and even sell branded merchandise through CafePress, an online storefront. Ning is not free — except for a 30-day trial period. However, pricing is very affordable, starting at $2.95 per month for up to 150 members. There are two pricing tiers beyond that: the “Plus” and “Pro” plans at $24.95 and $59.95 per month, respectively. The Plus plan is for up to 10,000 members, while the Pro plan offers an unlimited number of members. Though a number of larger companies are using Ning, I believe, due to its low-cost and ease-of-use, it is best suited to the needs of small business. The entire CurrySimple site is powered by Ning. 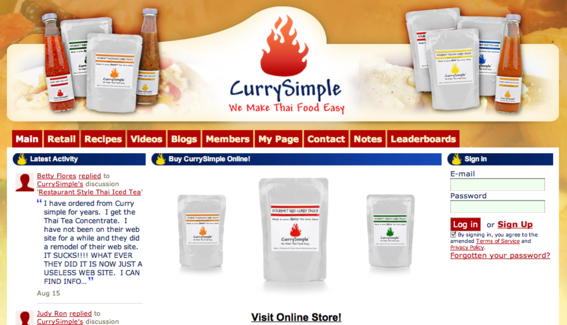 Ecommerce merchant CurrySimple offers ready-to-heat, restaurant-quality Thai sauces on its website and through a wholesaler network of retail stores. Aside from the shopping cart, CurrySimple uses Ning not only for its online community, but to run the entire site! Customers are encouraged to post recipes, photos and cooking videos using CurrySimple’s sauces. 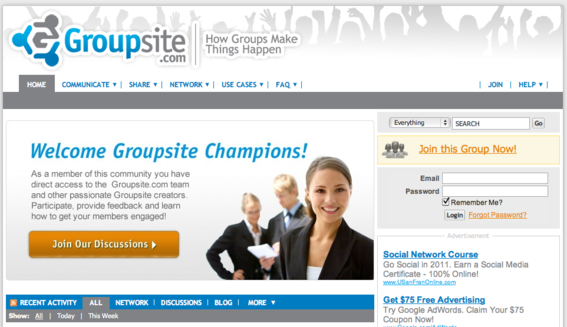 Groupsite focuses on social collaboration in groups. Another low-cost option is Groupsite. This, too, is a hosted solution that offers many of the same features as Ning. Pricing is more expensive, however, starting at $30 per month. Groupsite bills itself as “social collaboration” software, which suggests that the focus is on the group itself more than on the brand. While it could be argued that any online community software is designed with collaborative purposes in mind, one of the ways Groupsite sets itself apart is as a platform for smaller, closed groups. For ecommerce merchants, this could mean establishing an invitation-only group consisting of the most loyal customers, expressly designed for the purpose of gathering feedback. It could also be useful for internal communication or as a way to network with vendors. 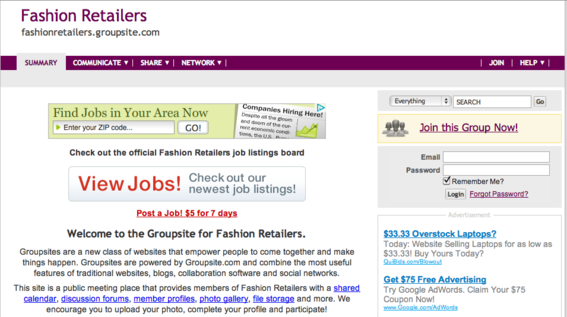 Fashion Retailers is a popular site powered by Groupsite. Fashion Retailers is a group powered by Groupsite that numbers over 5,000 fashion retail industry members. The community is used to post job listings, host industry-related discussions and as a tool for networking. vBulletin is available for purchase via low-cost license. Forums — also referred to as bulletin boards — are one of the original types of online communities. 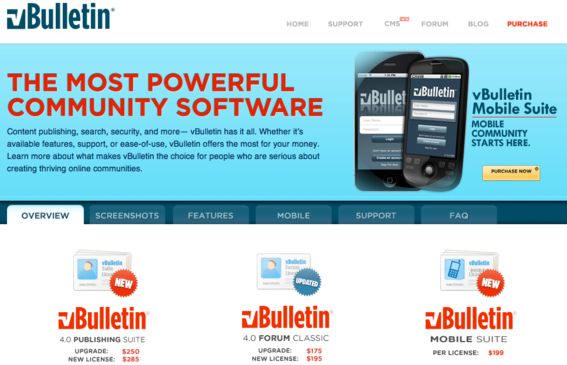 And vBulletin is one of the most popular freestanding forum software platforms. More recently, vBulletin has expanded from the classic forum model and now offers a community suite consisting of forums, photo albums, groups, event management, polls, blogs, and article-based content management system publishing. There is also a mobile version. Unlike Ning and Groupsite, which are hosted solutions, vBulletin has to be downloaded to your server. You must purchase a one-time license to use the software. Licensing for the full suite is only $285 per installation, while licensing for the forums-only version is $195 per installation. Sportsmith sells fitness products. The company uses vBulletin to run its online forums, which cover topics ranging from fitness equipment to training and management. The software platform used to build an online community is important. But it is less important than the role played by the community manager. Well-known community strategist Connie Bensen says emphasizing technology is a misplaced priority.